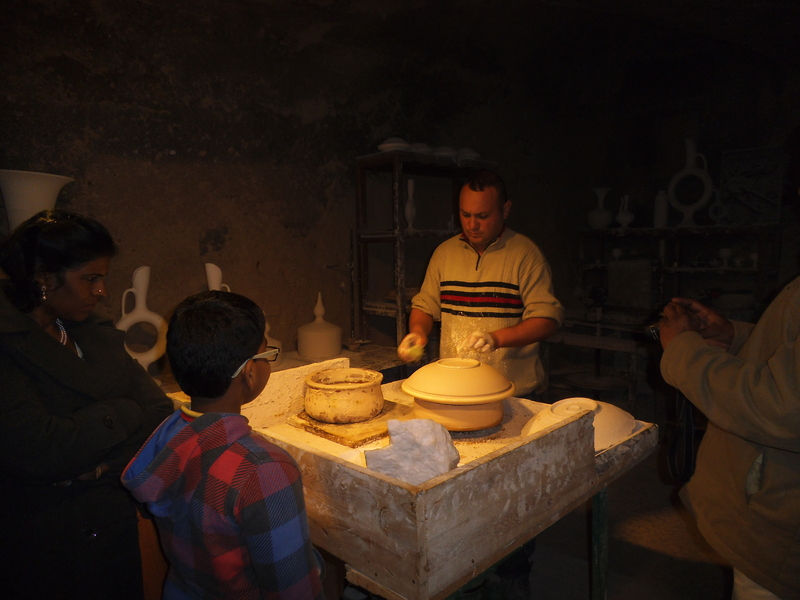 Taşkonaklar Blog – Sayfa 2 – Welcome to Cappadocia! If you enjoy a glass of wine, then Cappadocia is a place to to partake of the fruit of the vine. You will find four local wineries who each make a variety of types: Turasan, Kocabağ, Kapadokya, and Şenol. The most popular red wines are Öküzgözü (grown in Elaziğ), Boğazkere (grown in Diyarbakir), and a mix of the two. The biggest selling white wine is made from the locally grown Emir grape. Two of the companies (Kapadokya and Şenol) only make these four types of wine while Turasan and Kocabağ make these four plus a host of other types including Merlot and Cabernet Sauvignon (grown in Izmir). Turasan is the biggest and oldest winery based in Cappadocia with over 25 types of wine. Their factory is in Urgup, and they offer factory tours (for a fee) and tasting. Started in 1943 you can find their wine in most stores (that sell alcohol) and restaurants in Cappadocia as well as throughout Turkey. 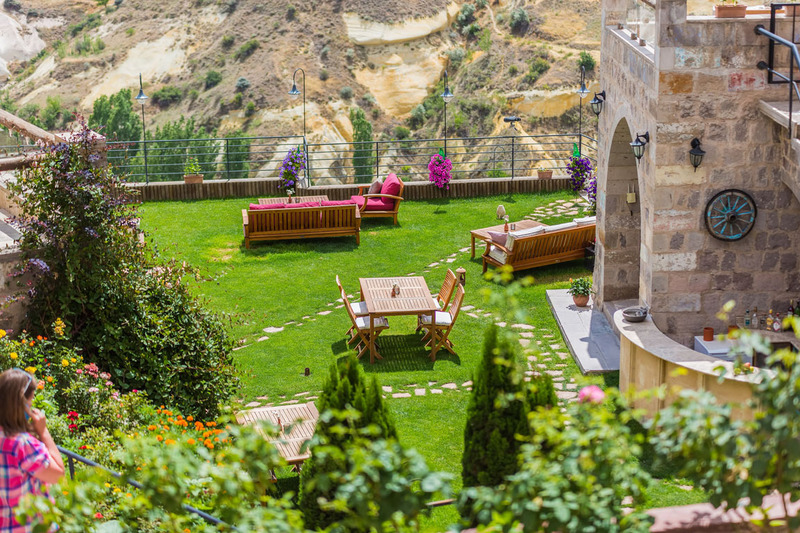 Kocabağ Winery has been opened since 1972 and has tasting rooms in Cappadocia in both Urgup and Uchisar. They make about 17 different wines. Their higher quality wines are branded with the Kocabağ name. These are wines that use grapes grown in Kocabağ vineyards at different places in Turkey. If they make wine using grapes bought from local vineyards, generally a lower grade grape, they brand them under a different name and put the Kocabağ name in a much smaller font on the bottle. Turasan and Kocabağ are 2 of the larger wineries in Turkey. The remaining two Cappadocia wineries are on the smaller side and are a bit harder to find. Kapadokya Winery was opened in Mustafapasa in 1956 and is a family run winery. They only make 4 wines (Öküzgözü, Boğazkere, a mix of the two, all red wines; and Emir, a white wine made from grapes grown in Cappadocia). They do not own their own vineyards but buy their grapes from local vineyard owners. They make their wine in a unique way by not separating the juice from the pulp during the fermenting process. It makes the wine much more aromatic almost smelling like grape juice. It makes for a unique flavor that will probably not be as popular to wine connoisseurs. They sell most of their wines through hotels and restaurants around the country (especially Antalya) making it difficult to find outside of the wine shops in Mustafapasa. Şenol Winery, like Kapadokya mentioned above, only makes four types of wine. Opened in 1959 in Mustafapasa they have been run by the same family. They are a small winery only producing 300,000 liters annually. They sell most of their wine in hotels and restaurants. If you want to try them, take a trip to Mustafapasa and enjoy a tasting in one of the many local wine shops. These are the four wineries producing in Cappadocia. Take some time while you are here to taste the different brands and let us know which is your favorite. Do you appreciate uncertainties when you are planning your vacations? Neither do we, which is why we want to help you with the Cappadocia weather forecast. 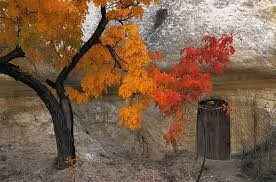 Cappadocia has four distinct seasons and is relatively mild in each of them. The winter lasts from November through March, April to mid-June ushers in the spring, and then summer runs through the end of August. September and October bring about the fall transition back to winter. 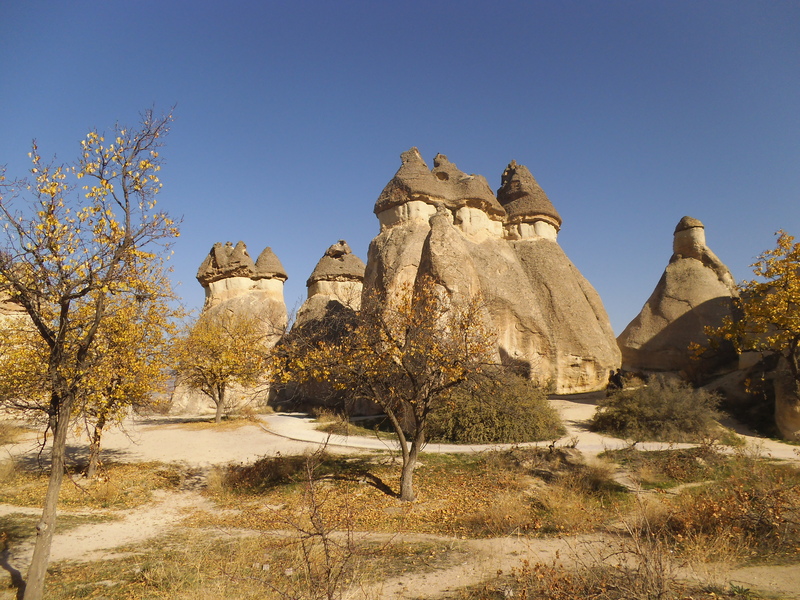 Generally speaking Cappadocia’s is a dry climate, do not expect much humidity. Look for some winds in the spring and some fog in the late fall. Rain in the summer is a rarity but not uncommon in the fall and spring with a few snowfalls each winter. The hot air balloons fly up to 330 days per year! The winter will see a few snowfalls with 15 centimeters being a lot for one storm. 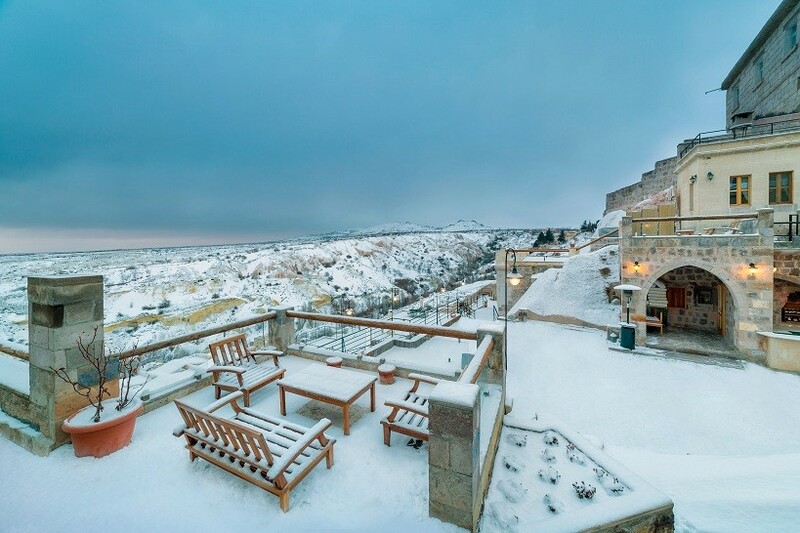 Cappadocia weather during the winter months is quite unpredictable. One day could be cold and rainy, the next snowy, and the next nice and sunny. Oftentimes the extended forecast is wrong so if you are coming to stay in a cozy boutique cave hotel during these months, be sure to dress in layers and include a winter coat. Most days will be near freezing and the nights will see negative temperatures. Those who get to see Cappadocia blanketed with snow experience a special trat, but predicting which days will snow is nigh impossible. 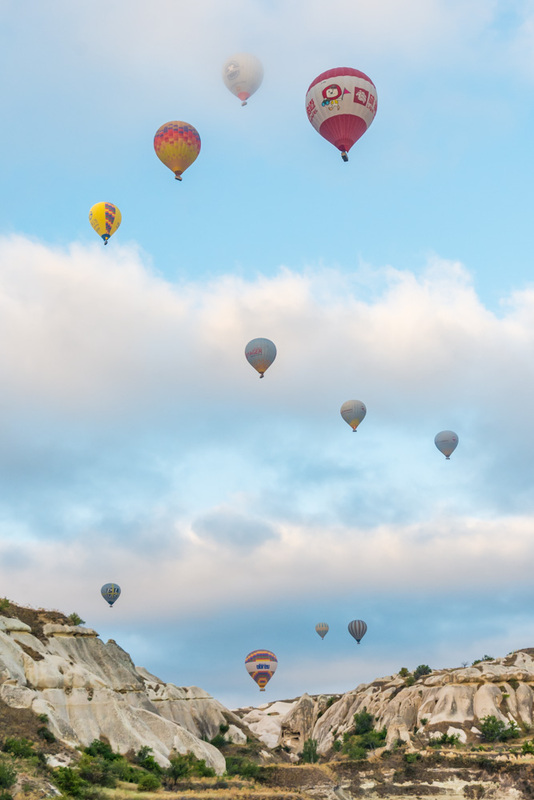 Late April and May are the nicest months to visit Cappadocia. In early April expect windy days and a number of hot air balloon cancellations but by the end of the month and all of May the rains usually have stopped and most every day is paradisical. Expect temperatures on most days to be between 20-25 celsius with sunny skies (the first half of April is more uncertain). On a few days do not be surprsied to run for cover from a scattered thunderstorm. Cappadocia’s summers are dry and hot but not oppressive. As you look around the towns and villages, you will notice that very few of the local residents have air conditioners. This is because the temperatures reach 40 degrees celsius for 3-4 weeks at most, usually from late July to late August. These are the most certain days with an almost monotonous perfection- sunny, dry, and hot. Ahhh, Cappadocia weather in the summer. 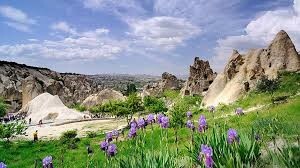 Cappadocia’s fall mirrors the spring. September and October along with late April to early June are the nicest times to be in Cappadocia if nice weather is your cup of tea. Warm sunny days followed by cool evenings with beautiful sunsets every night. And thus we have completed the circle through a year of Cappadocia weather. Whether you prefer sitting by your cozy cave room fireplace while it is snowing outside or hiking the valleys in shorts and sunglasses, now you know when to book your trip. Cappadocia is an ancient land with a fascinating religious history. It is even mentioned in the Book of Acts in the Christian Bible. The earliest Christians were here almost 2000 years ago and by the 3rd and 4th centuries were using the caves for churches and monasteries. They lived here without pause until the 1920s when they were forced to move to Greece. Besides caves many Greek church buildings are still standing. Islam entered with the Seljuks after 1200, and they built mosques and madrasas as well as caravansarais in the region. Many visitors to the area are unaware of this and miss out on all that is available. Of course, one can only see so many caves before they all meld together, but we will let you decide which caves to see before passing that line. 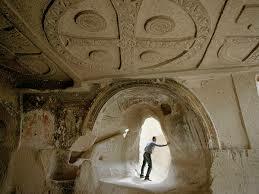 The most popular group of cave churches can be found at the Goreme Open Air Museum. This community of churches with their breathtaking paintings dates mostly from the 9th-11th centuries. But there are a number of other ancient cave churches close by. On the road to the museum take a right before the horse ranch and go up a ways to see the El Nazar Church. Right after the horses on the right you will find the Sakli Church. Then after the museum, further up the hill, you will find the Aynali and Firkatan Churches. Most of these require small entrance fees. Move down the road a ways to Cavusin village and see the lower church behind Cavusin Seramic. Then head up the hill to the upper church which claims to be the oldest and biggest church in the region. There is not much left of this one and getting to it can be an adventure, but once inside you will see that it was a church in the distant past with its faded paintings. Around the corner from Cavusin and past Pasabag you will find Zelve Open Air Museum and its churches and monasteries. This area was inhabited until the 1960s but is now a national park. You will not find ao many paintings here, but the space is larger and less crowded and the entrance fee is less than Goreme’s museum. Next head past Avanos to Gulsehir where you will find the beautifully restored St. Jeans two-story cave church. On the other side of town is the old Greek area where you will find not a cave church but a real building. Ask the Muhtar for the key and look around. This building is not restored so you will find it rather barren. On the way back to Avanos take a detour through Ozkonak and view the unrestored Belha monastery as well as the underground city. If you go all the way past Urgup you will soon arrive at Mustafapasa which was formerly known as Sinasos when the Greeks inhabited it until 1924. But before arriving don’t miss the cave churches up the hills to the right side of the road between Urgup and Mustafapasa. You could spend hours traipsing around these hills exploring the numerous caves. In Mustafapasa you will find both cave churches and buildings, remnants of the Greek community that lived there for over 1000 years. 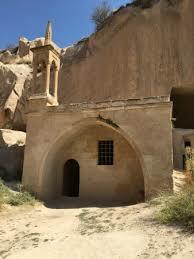 Besides these places you will find cave churches in Red/Rose Valley as well as Ihlara Valley. In addition, hike or drive around Cappadocia and do not be surprised to find countless cave churches off the road in every direction. While heading down towards Ihlara stop to see the churches within Kaymakli and Derinkuyu underground cities. Keep going and find Monastery valley outside of Guzelyurt. Not far from there is the Red Church and the Upper Church (Yuksek Kilisesi). Then in the cities of Nigde and Kayseri (not common stops for most visitors to Cappadocia) you will find many more ancient church remains. But as we mentioned earlier the Seljuk Muslims moved into the area after 1200 and left their mark with many mosques and madrasas. The Ottomans continued this architectural development and the Turks have followed on with similar zeal. For the truly grand Islamic buildings Istanbul is the place to be, of course, but Cappadocia has its share of historic sites. Every town and village will have mosques which you can visit if you show the proper respect. But a few buildings standout which we will note here. Nevsehir’s mosque, madrasa, and hamam complex was built by Nevserhirli Damat Ibrahimpasa when he was Grand Vizier in the early 1700s. Also, Kayseri has a beautiful Seljuk complex standing in the center of the city. Avanos’ Alaadin mosque purports to be 800 years old (at least there has been a mosque on that site for 800 years according to locals). And you may enjoy Cavusin villages cave mosque, one of the few cave mosques in the region. Besides these and many more you will also find ancient caravanserais built mainly by the Seljuks but used throughout Ottoman times. Most of them lie in ruins but a few have been restored and are available for tours. Lastly, head northwest of Avanos to Haci Bektas for a unique experience. Turkish Alevis, a curious sect of Islam and minority group within Turkey, look to this town as their core and the mystic after whom it is named as their spiritual father. Here you will find a museum complex explaining the beliefs and practices of this man and his followers. And with that you have taken the spiritual history tour of Cappadocia. Europe has its magnifient cathedrals and Istanbul its grand mosques, but Cappadocia is unique with its mix of evidence of the human search for connection with God both below and above ground throughout the last 2000 years. Enjoy taking a bit of it in while you are here and let us know what you think. 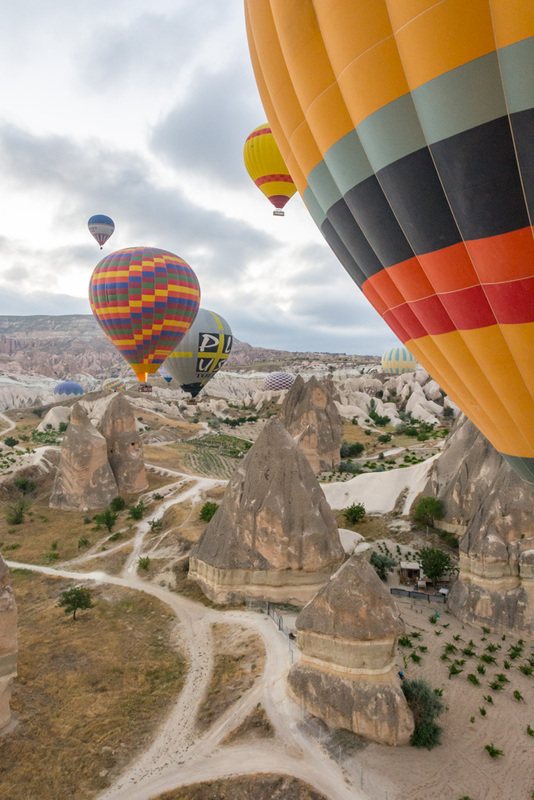 Taking a hot air balloon ride in Cappadocia is a once in a lifetime opportunity for most people. The excitement builds as the plans come together. The plane tickets are purchased, the hotel is chosen, the tours are discussed, and the hot air balloon is reserved. Then the day comes when you are turning out the light a bit earlier than normal for the very early alarm. A few hours later you find yourself hopping out of a bed at a time normally reserved for dreaming. But today dreams are coming true so why keep sleeping? The adrenaline is immediately flowing and your lips curl upwards into a perpetual smile as you get ready, head to the lobby of your boutique cave hotel, and wait for the hot air balloon company van to pick you up. After a cup of tea or coffee and a bite to eat you wait on pins and needles for the hot air balloon staffer to tell you the time has come to get back in the van. Your silent prayers for light winds have been answered, that little bit of anxiety vanishes, and the excitement really starts to build. A few minutes later you exit the van and watch the crews finish blowing up the balloons while trying to capture every aspect on digital film. Once the balloon is hovering above your basket, they help you climb in and start giving the instructions. Silently and with no fanfare all of the sudden you are floating. That moment is truly freaky in its non-eventness. Airplanes build speed and gradually take off, first front wheels, then back. Rockets have the countdown and then all the smoke before finally ascending. Hot air balloons are on the ground one second and off the next, and unless you are watching you do not even realize what has happened. 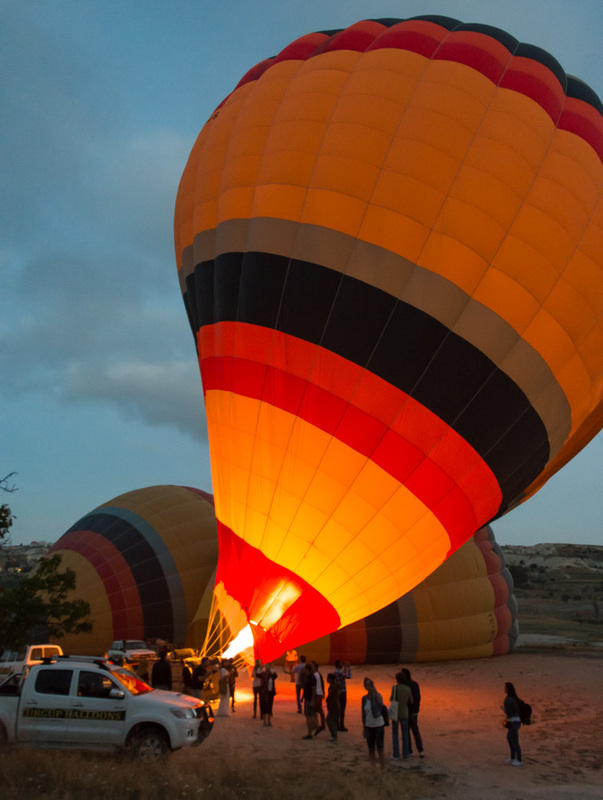 The ground becomes a distant mass as the intermittent Darth Vader-like sounds of the burning propane send the hot air balloon above Cappadocia’s valleys and fairy Chimneys. The experienced pilot who has done this countless times has no directional control, only altitude and spin. Like a blown dandelion you go where the wind takes you. 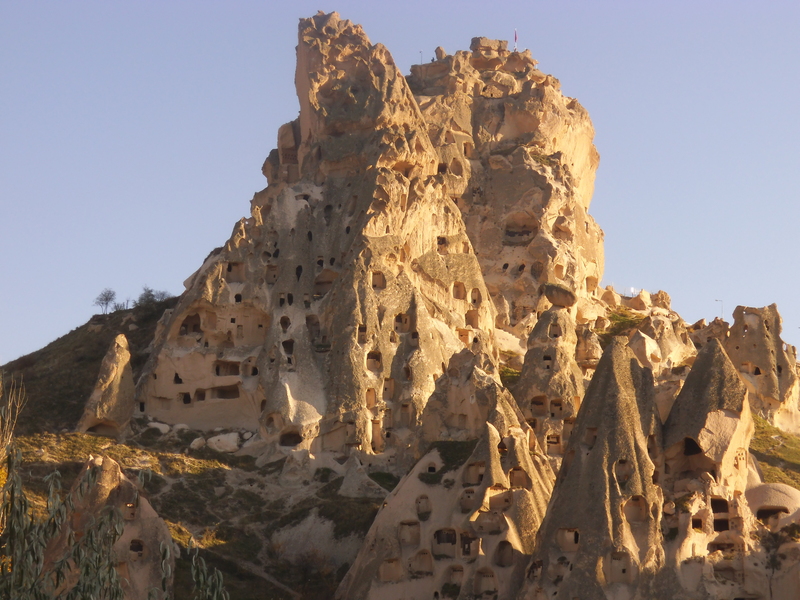 In Cappadocia that means in and out of valleys and around fairy chimneys. Even with slight winds you will be surprised how far you travel in an hour. But in spite of your wishes, the 60 minutes does float by, and next thing you know you are descending into a random Cappadocia field. Assuming the landing position, you brace for impact, and…bump! The crew jumps on one side to keep the basket from bouncing or tipping, and once everything is settled, they help you back onto land. Quickly a table is set up and an impromptu ceremony begins. Champagne or juice or Mimosas all around and certificates or medals handed out. Once everyone has finished snapping photos and thanking the pilot and crew – don’t forget to leave a tip – you are back in the van and returning to your hotel for second breakfast, as the hobbits would call it. The day has not even really begun, and you have made a lifelong memory. We can’t wait to see you in Cappadocia. 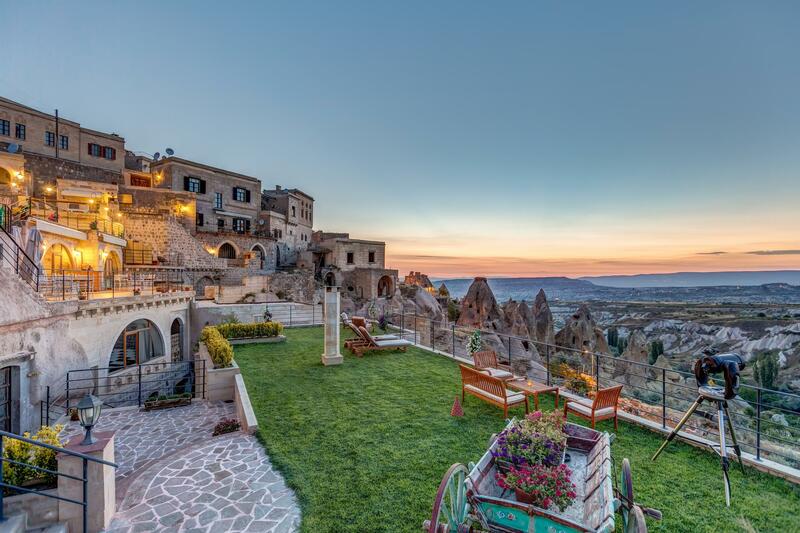 You have perused the lists and now have to figure out how to see your favorites in Cappadocia. Perhaps one of the Cappadocia tours is the way to go? Read on to find out. You can choose between custom or package tours. Your hotel will be able to help you set these up, but we want to give you some preliminary information to help you determine which of the many alternatives is best for you. Now that you have arrived in Cappadocia how are you going to get around from site to site? You have a few options but Cappadocia is quite spread out some valleys and the underground cities being 45 − 90 minutes away from Uçhisar by car. We recommend thinking about this ahead of time which is why we are giving you this information. The land of fairy chimneys, underground cities, ancient cave churches, hot-air balloon rides, and thousands of years of history is awaiting your discovery. Whether you are staying at the Taşkonaklar Hotel or have arranged other accomodations, our goal at the Taşkonaklar Blog is to help make your visit to Cappadocia unforgettable.